I have always been troubled by the approach to Christ’s teachings in Scripture on money (mammon, etc.) in which the conclusion is: it’s ok to have it but we shouldn’t be attached to it. The trouble for me comes when this teaching is found addressed to people who have plenty of money. There is quick agreement and everyone then does their best (I suppose) to not be too attached to what they have. My general impression of Christ’s teaching is that it is always more concrete than abstract. To the rich young ruler Christ does not say, “Try not to be attached to your money.” He says simply, “Give all you have to the poor and come and follow me.” Of course the issue of the rich young ruler is not that he has wealth, but that apparently his wealth has him. It is a choice between his soul and his money. Such a choice should be clear. I am deeply sympathetic with the rich young ruler. It is hard to suddenly confront the truth of your heart and make the step into the Kingdom of God in a single moment. However, I am certain that there is no way for a person to “finesse” his way into the Kingdom of God. Our moments come in many shapes and sizes. Some of them may be marked by a dollar sign, others may be as simple as telling the truth. The marvelous shape of grace is that there are such moments. Imagine living a life in which the moment to enter the Kingdom of God was so subtle it passed you by. I give thanks to God for His lack of subtlety. Whatever the moment brings may God’s grace give us each the courage to see things for what they are. No matter the choice, it’s really nothing more than a nail or a bit of fluff. It would be a pity to miss the Kingdom for want of a nail. 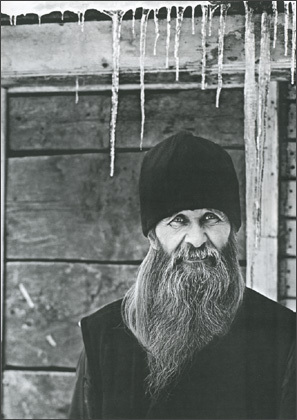 Photo: The monk Isaac from Valaam Photos. Resonates as truth; moments like that strike hard with their clarity. The choice between two options becomes so defined that paralysis ends and one way is taken, one is not. In some ways, it’s relieving…especially after a long season of wondering. The face of that priest is so kind and I love the little twinkle in his eye. Thanks for posting it. This is a wonderful post, but I’m a little confused. Are you disagreeing with what you quoted from Abba Zosimas? I have no idea who he is, I just would like clarification. Also, is there a tradition about what happened to the ruler after this story? Did he make a different choice later on? Did he get more than one moment or was that it? Do we get more than one moment or is there one point where one consciously chooses this way or that? Obviously one’s day is full of small choices like that, but is there a point of no return, so to speak? This parable has always been a difficult one for me. Whenever I read it, I want to sell everything I have. How do we know when that’s literal or when it’s an example to be followed, but in other areas? And what *should* people with money do? I was agreeing with Abba Zosimas, one of the Desert Fathers. It would be tragic if we chose something which, as Abba Zosimas says, is really of no more value than a nail, rather than the Kingdom of God. I am not aware of any later tradition on the rich young man. But moments are not necessarily singular. Scripture tells us that God is merciful. If you think of the history of Israel, He gives them moment after moment after moment. God never gives up. Probably the best thing to do with money is first: tithe it (10 per cent). If you have a lot of money give more. Don’t use it for power (trying to give it where you will get people to do what you want them to do). In a number of cases in my life as a priest I have had individuals come to me who wanted to give money and they said, “Father, you direct where it should go, I want to give but I do not want to control anyone with it.” Such cases of generosity have been truly salvific moments for people. I practice the tithe, and teach it, and remember that St. John Chrysostom said that if the standard in the Old Testament was the tithe, how much more should we do as Christians? But there is no law here, per se, just as there is not in fasting. But it is a good ascetic practice and a way to begin having some freedom from a very powerful adversary. This reminds of a quote I read somewhere, on how a person should know if they truly love somebody (potential spouse), and that marriage is the right thing: When they can honestly answer yes to the question – would you still love this person even if the bankrupt you? I guess by that standard, few of us really love – and we are not even speaking about loving God here! The monk’s proposal gets hard for those of us with children, or other family to support. Surely my children are not worthless old nails. And they need food, clothing and a roof over their head. But do they need a large home in a good neighborhood and a backyard? Do they need quality private schools? Do they need swimming lessons and piano lessons? At what point does love and care for our family become a disguised way of idolizing them or the things we obtain for them? Tithing is a very helpful discipline to keep things under control but not a complete answer. I think the face of that monk is one of the kindest I have ever seen. His eyes radiate love. Thank you for posting it Father. I also wanted to comment on that parable. Recently I went to a talk by Fr. Michael Duhilich on raising and keeping children in the Church. He used this parable to point out that the rich young ruler had everything right. He was a young man in the right place (Jerusalem) at the right time (the time of our Christ’s earthly ministry), asking the right question (“What do I need to do to inherit Eternal Life?”) of the right person (the Lord Himself)and he received the right answer…but he still made the wrong choice. The message was that we can seemingly do everything “right” for our children but ultimately they will make their own choices and sometimes, they will choose wrong. Surely, we do not give-up on our children the moment they make a bad decision. I don’t know what tradition says about the rich young ruler after he made the wrong choice but I do know that God is merciful enough to allow us to fail in our obedience to Him over and over and over again and never love us any less for our stupidity and sinfulness. He continues to knock, so there is always hope. This brings me great peace regarding my children but also regarding my own hardened heart. Maybe I didn’t follow yesterday, or the day before that, or last week…but today I can repent and try again to follow, to give what I have to God and love others. Surely that opportunity exists as long as we have breath. I’m not sure why the smily face appeared in my comment. It doesn’t really fit there. So sorry. I too have to admit with MRH that this seemingly simple issue can become quite difficult to apply. What is too much? By whose standard, pray tell? It can be easily argued that the poorest among us here in the U.S. live like royalty of yesteryear. What is then is to be judged “necessary” in contrast to “discretionary”? Where to draw the line? These questions (and assumptions) are so deeply woven into founding priciples and the very existence of modern society, that I don’t have a clue as to where to start. We all are products of this society (protestations not withstanding) whether we like, or are aware of, it or not. The only reasonable starting point appears to be a complete “tuning out” as did the Desert Fathers and ascetics. Perhaps there is a “middle way” for us? Thank you for your time, Fr Stephen. There are no simple or legal solutions, only solutions of the heart. I practiced the tithe and found it a blessing, with children, etc. But I can’t decide for someone else. Children aren’t nails, yes indeed. I would give anything I have for the salvation of my children – none of whom do I doubt in their communion with Christ. God has been kind. But I have no doubt that I would do that. I also found great support from my children when we became Orthodox, though it changed their financial lifestyles as well. It’s just something, among others, that we have to confront in our hearts as we search for the Living and True God. Thank you Fr. Stephen for your response. It is truly a matter of the heart. The comment by BShelly about the Hearst Castle illustrates my point. Surely by the standard of living of 99.9% of us, the Hearst Castle is, quite frankly, obscene. However, by comparison, my lifestyle I am sure is obscene compared to 99.9% of those living in Africa. So who are we to judge Mr. Hearst, then? For years as a Protestant I practiced tithing. As an Orthodox Christian now, looking back, I have to question even tithing – not because of principle but because of matters of the heart. Am I tithing “to get blessed” or because I desire to give? Money gives us command over resources, including our fellow human beings. Quite a heady position. That’s why rich heirs get so riled when someone tries to cut themselves a chunk of the family fortune through a contested will or otherwise. Money provides their status and their power; their status and power determine their identity. In this world, money and power are where it’s happenin’. Do we treat well dressed folks differently than the shabby? Do we show more respect (or hatred) to the BMW driver than the driver of the 20-year-old pickup? The driver of the 20-year-old pickup doesn’t even show up on our radar screens. There’s nothing modern about this. Back in the old days, a young noble who faced disenfranchisement by being conquered preferred dying in battle than living like an ordinary slug. How many folks live like pack rats? How many folks can’t fast? How many folks can’t give to the poor? How many folks can’t sit quietly without some kind of external stimulation? Ultimately, the more control we have over our immediate environments, the less dependence we feel on God. Visibilium, such usages of money are false and clearly are condemned as sinful. There are however many good usages of money. I have not come across an instance in Scripture where money or wealth in and of itself is condemned as sinful. The parable of the rich young ruler is, indeed, a difficult one to interpret and practice. As a Protestant pastor of some 25 plus years, raising three sons in the parsonage, with a spouse on disability, tithing 10% was a challenge. Yet, we practiced it believing it to be the least that we could do with the resources that God entrusted to us. What was amazing was that our children did not seem to suffer because of our faith. They did not always have the best or newest or what was in style as teens, but they were blessed in other ways. For me, the rich young ruler perhaps misunderstood that all that he had was God’s to begin with. Perhaps the attitude of the heart is what counts. Still, in all honesty, selling all is not something I am ready to sign up for! However, as others have posted, I find myself questioning “how much stuff is enough stuff?” in a nation of such wealth as we are blessed with? I find the Lord confronting me in prayer times and times of silence about letting go of some things. It is not easy because it goes so much against the dominant culture we live in. Again, my heart’s attitude and submitting to the Lordship of Christ seems to be the key to wrestling with this example. Thank you for your response to my coment. I come from a strong tithing background, but my experience of Orthodoxy has put much less emphasis on it. I agree that it is a valuable aescetic tool and one which, like fasting, I wish I was much better at practicing! I also agree that it’s difficult in our culture of abundance and opportunity to find a proper balance. I suppose that part of the discipline is the constant struggle and tension that it does (and should!) bring. “Who, then, is greedy? – The one who does not remain content with self-sufficiency…The bread you hold on to belongs to the hungry; the cloak you keep locked in your storeroom belongs to the naked; the shoe that is moldering in your possession belongs to the person with no shoes; the silver that you have buried belongs to the person in need. You do an injury to as many people as you might have helped with all these things! Thanks for that word on tithing, Father, it clears a lot of things up for me. The story is told of the wealthy parishioner who came to his pastor after reading the passage on the rich young ruler. “Don’t be so sure,” the pastor replied, and explained in detail how Christ had discerned this particular young man’s heart. Christ’s instruction to the rich young ruler did not necessarily to him. I was taught to tithe, and one of the most satisfying things about graduating college and having my own job was being able to do so. Now that I have a family and we have a single income, it is more tempting to think about what use we might be able to put that “extra” money to. But I realize that even were we to keep it all, we wouldn’t be content with what we have. We would also miss out on the blessedness of being able to give to others and, most importantly, on the freedom that comes from trusting God in this small way to meet our needs. It is more of a challenge to me to think about how I spend my time than my money. Sin is a great thief of time and opportunity as well. Keeping my prayer rule and discipline in the use of my time are often a great struggle. When I read the Apostle’s words in Gal. 5:15-16 about being wise and circumspect in one’s lifestyle, “redeeming the time, because the days are evil,” I am convicted. Lord, have mercy!